The following document was obtained from the public website of a fraternal law enforcement organization. (U//FOUO) Terrorist and violent extremist groups have long expressed interest in poisoning and adulterating food and beverage supplies in the West but rarely use this as a tactic. Nonetheless, recent incidents in Europe and Africa underscore the continued interest by some groups in targeting food products at point-of-sale, distribution, and storage. The mere threat of product adulteration in the Homeland almost certainly would cause psychological and economic harm. 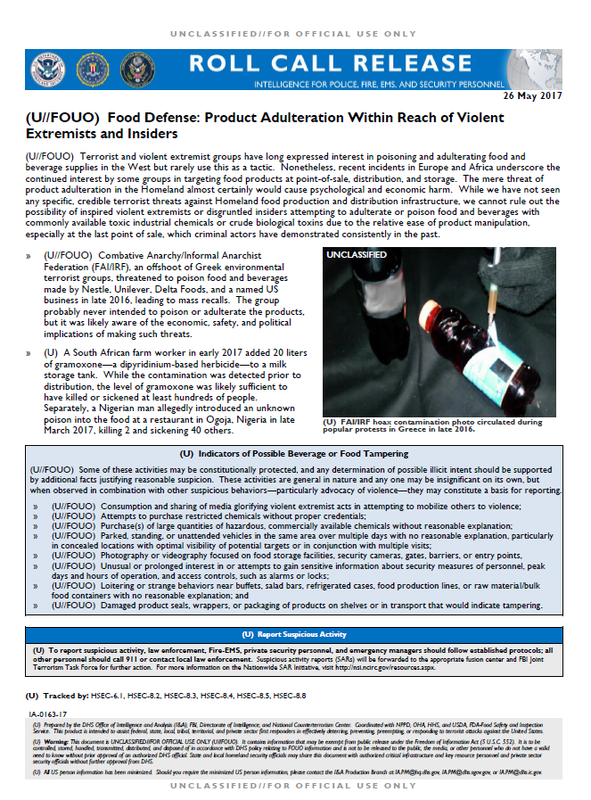 While we have not seen any specific, credible terrorist threats against Homeland food production and distribution infrastructure, we cannot rule out the possibility of inspired violent extremists or disgruntled insiders attempting to adulterate or poison food and beverages with commonly available toxic industrial chemicals or crude biological toxins due to the relative ease of product manipulation, especially at the last point of sale, which criminal actors have demonstrated consistently in the past. » (U//FOUO) Combative Anarchy/Informal Anarchist Federation (FAI/IRF), an offshoot of Greek environmental terrorist groups, threatened to poison food and beverages made by Nestle, Unilever, Delta Foods, and a named US business in late 2016, leading to mass recalls. The group probably never intended to poison or adulterate the products, but it was likely aware of the economic, safety, and political implications of making such threats. » (U) A South African farm worker in early 2017 added 20 liters of gramoxone—a dipyridinium-based herbicide—to a milk storage tank. While the contamination was detected prior to distribution, the level of gramoxone was likely sufficient to have killed or sickened at least hundreds of people. Separately, a Nigerian man allegedly introduced an unknown poison into the food at a restaurant in Ogoja, Nigeria in late March 2017, killing 2 and sickening 40 others. » (U//FOUO) Damaged product seals, wrappers, or packaging of products on shelves or in transport that would indicate tampering.